Remember the silver accent mani? It was dying for a party, so I changed the look to a taped crosspattern. I wanted the look to be more colorful but in a mysterious way. The final result is very graphical and has something spacy. The crosspattern is different on each nail, I just placed the tape strips in random cross shapes, changing the angular degree a bit everytime. Then I added three colors to the black that already had the silver stripes on the tips. 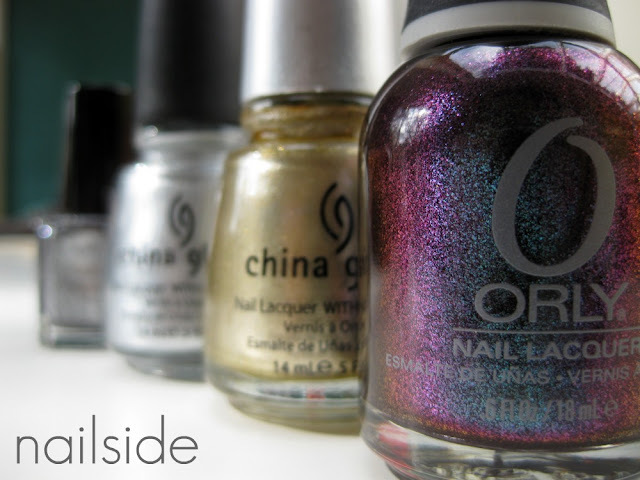 The extra polishes I used are China Glaze's Midnight Kiss, a dark silver foil from Hema and Orly's Galaxy Girl, one of the prettiest polishes ever! Galaxy Girl really adds a new dimension to the whole with its changing finish, sometimes it looks purple/pink and then it's turquoise again. It doesn't show very well on the pictures though, but it's there in real life. It's there! Hahah :P So glad you like it! Thanks so much! Wow this is amazing! Great mani! I love this manicure and your blog is awesome, really. I have been looking for CG Millenium and 2030, maybe you could help me. Where and when did you get these?